We make lots of jokes about the importance of good grammar. Some of us are grammar Nazis who lurk on Facebook and other online forums ready to correct the "great unwashed masses" when they forget an apostrophe or misuse to, too, or two. Others are the type telling these seemingly obsessive protectors of the English language to "lighten up" because it's "just the internet after all" and "no one can expect everyone to be perfect all the time." Whether you fall into one of these groups or somewhere in between, the simple truth is good grammar is important. If you ask the average person on the street whether or not using good grammar is important, you may be surprised at the variety of responses you will receive. It seems the debate over the significance of prescriptive English grammar is alive, and sometimes slightly aggressive, in the court of public opinion. My personal belief is that the study and mastery of proper English grammar is not only necessary, but also imperative. Our students’ overall success beyond the academic world is dependent upon their ability to write and speak clearly and professionally – an impossible task without at least some degree of working knowledge involving grammar. My ideology regarding English grammar has developed not simply because I am a teacher of English, but also due to the fact that I have spent so much of my life performing a variety of jobs in the private sector including many years spent as a hiring manager for several different businesses. In this digital age of texts, tweets, instant messages, and emails, some will argue the use of prescriptive grammar has become out-dated or even archaic; however, when it comes to the professional world nothing could be farther from the truth. Kyle Weins, CEO of iFixit and Dozuki, administers grammar tests to every applicant for every position in his companies. Weins’ justification for using this tool across the board is “grammar signifies more than just a person’s ability to remember high school English. I’ve found that people who make fewer mistakes on a grammar test also make fewer mistakes when they are doing something completely unrelated to writing — like stocking shelves or labeling parts” (2012). While Weins’ tactics may be slightly more militant than those employed by other companies, the simple fact is more companies today are including grammar and writing tasks in their application processes. These businesses are also turning more potential employees away due to their inability to successfully complete these activities. Ultimately, it doesn't matter how intelligent, capable, or qualified applicants may be, if they are incapable of presenting themselves competently through their speech and writing. For better or worse, using poor grammar portrays a person as careless, lazy, or at worst ignorant. None of these qualities are highly sought after by any business owner. In this age of electronic applications, contact with potential employers can be limited to written artifacts like cover letters, resumes, and personal websites or social media profiles. Our written words represent our first, and sometimes only, impression. The ability to use proper grammar signifies not only credibility and professionalism, but also commands a degree of immediate respect from those reading and reviewing the materials presented. 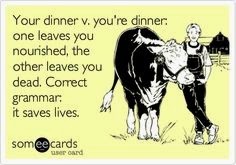 This in itself is more than enough reason to ensure our students learn and master grammar. Now that I've gotten that out of my system, I will leave you with a bit of fun. Weird Al's take on grammar is entertaining and timely - as we ready ourselves to return to school and decide exactly where grammar fits in our classrooms no matter what subjects or grade levels we teach. I've looked through most of your posts and have found them invaluable. You have provided many resources that I didn't realize existed!